Looking for Adventure options, tropical Beaches, beautiful Landscapes, ancient Monuments, Wildlife sanctuaries or Spiritual Inspiration? Simply select your favourite theme and go to an interactive map that enables you to zoom into places that would interest and inspire you. 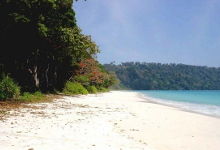 The mere mention of the Andaman & Nicobar Islands conjures up images of primeval rainforests teeming with rare fauna and flora, deserted beaches and coral reefs and mangrove creeks. Virtually unexplored and unknown to the outside world, this idyllic tropical paradise has recently opened up to foreign visitors, offering a most exotic and relaxing holiday on its beautiful palm fringed beaches and turquoise blue waters.